Rangers have signed French defender Jose-Karl Pierre-Fanfan from Paris Saint Germain on a three-year deal. The 29-year-old passed a medical on Tuesday and immediately endeared himself to the club's fans by saying that he turned down Celtic. 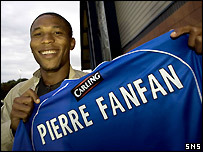 He signed for an undisclosed fee after Rangers came to an agreement with the French club. "Rangers really wanted me and were more professional so I was very happy to sign," he told the Rangers website. "This is a new adventure for me and I am very excited. I know this is a very big club and I know Rangers and Celtic are great rivals but I had no hesitation in joining Rangers. "They showed they really wanted me and that is important for a player. "This is a new challenge for me. I have won every major trophy in France and I want to do the same in Scotland. This club is hungry for success and so am I. "I have also been impressed with the training-ground facilities. Murray Park is very good and I am looking forward to working here. There is also the chance to play Champions League football and that is important for me as well." On Tuesday Rangers chairman David Murray had promised two signings within a fortnight to add to the acquisitions of Brahim Hemdani and Ian Murray on free transfers. "I made a promise to the supporters of this club and I intend to keep it," he added. "There will be a minimum of two players within the next 10 days to a fortnight and they will be brought in immaterial of the players I'm talking about leaving. "We have been working round the clock on this, travelling thousands of miles trying to get the players we need. "We are well down the road with these players. Our targets are high quality and I'm sure they'll please our fans, but these players will come in even if the players we want out don't go. "There are three or four players who do not have a future at Rangers and they know who they are. "Rangers have limited resources and we can't afford to pay high wages to players who are not producing."